After 10 years more than 1,000 scientists have been involved in identifying 16,570 species, including 6,129 species new to the Great Smoky Mountains National Park, and 890 species new to science and to the world. This All Taxa Biodiversity Project is the largest natural history survey ever undertaken in the United States. The data from the study will be used as a baseline to manage the park against air pollution and non-native pests. It's information will be used in class rooms and in research laboratories to further educate about the importance of preserving natural resources in your environment. Read more about it below in Great Smoky Mountains Inventory. 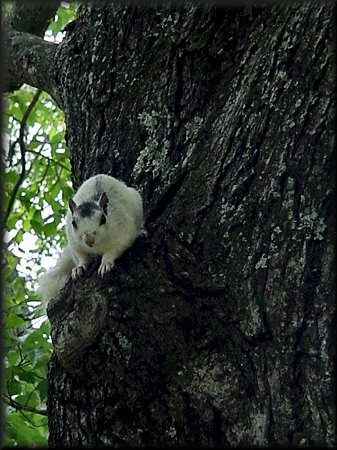 The Carolina Northern Flying Squirrel, that is found mainly in Western North Carolina, has been listed as an endangered species since 1985. 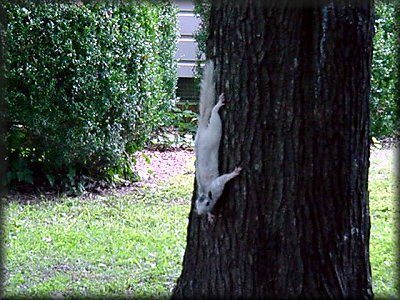 It is one of two flying squirrel species found in the United States. 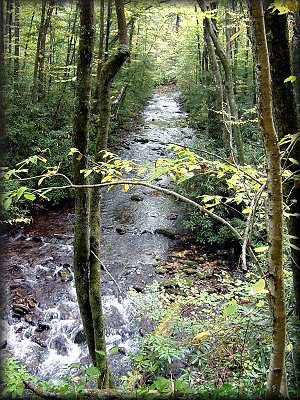 Along with being endangered, a small population in the Unicoi Mountains was discovered in 1988 and is one of the most endangered since the Cherohala Skyway divides their habitat. The Cherohala Skyway is a 36 mile long remote scenic road built over the course of 34 years. The good news is that NC Wildlife Resources Commission, with help from Duke Energy, has come up with a solution to reconnect as much habitat as possible. 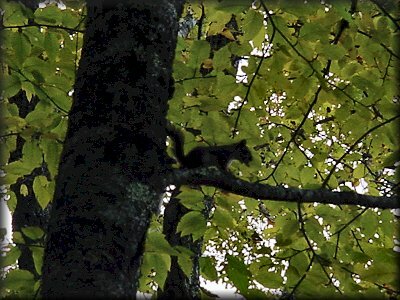 The squirrels use folds of skin running from their front to back legs to glide from tree to tree. This was no longer possible with the trees alongside the road, as they were not mature enough to serve as launching pads to cross the road that divides their habitat. The solution was to erect three sets of wooden poles that have "launching pads" on either side of the road. That way the squirrels could glide across the road and hopefully keep their small population from becoming smaller and having more genetic problems because of this. The larger an area that a species has, makes it much more likely that a catastrophic event will not wipe them out. Also the sides of the road are lined with briars and bedrock, this being unattractive to the squirrels. 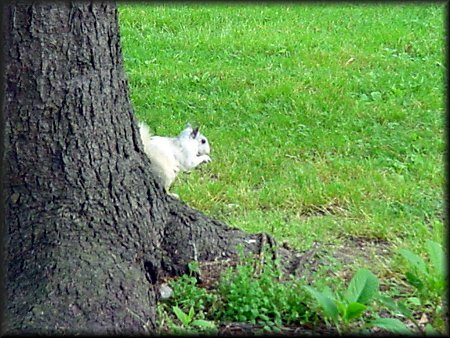 The squirrels also contribute to the health of the forest by eating fungi that undigested parts gets deposited (okay, pooped) in the soil that is taken up by the root systems of red spruce and fir trees. This is a rare type of forest in Western North Carolina. There is hope that this situation will lead to greater planning when roads are being built that will have dramatic impact on wildlife. An Audubon study released earlier this past month of Feb. 2009 found that more than half of 305 bird species in North America are wintering about 35 miles farther north that they did 40 years ago. This doesn't sound like much, but it is only the average, as the purple finch can now be found as far north as Milwaukee Wisconsin instead of Springfield Mo., a 400 mile farther north migration! The sandhill crane is now found 35 miles farther north than it did in 1966. Now bird ranges do expand and shift due to individual changes in habitat destruction and diet availibility, but this many changes in so many species is due to global warming. Since the average January temperature in the United States is about 5 degrees Fahrenheit higher, the study showed that from 1966 to 2005 about 1/4 of the 305 species moved south, but 177 species moved northward - about twice the amount. A great place for the western North Carolina community is the WNC Nature Center . 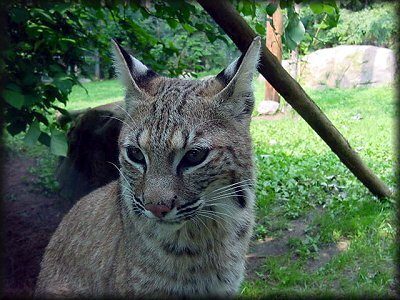 The Nature Center's mission is "To educate the public to the natural history and ecology of the Southern Appalachians". This is accomplished with fun and great exhibits of the wildlife found in western North Carolina. The Nature Center's staff is assisted by many volunteers and the non-profit organization dedicated to improving the Nature Center, "The Friends of the WNC Nature Center". 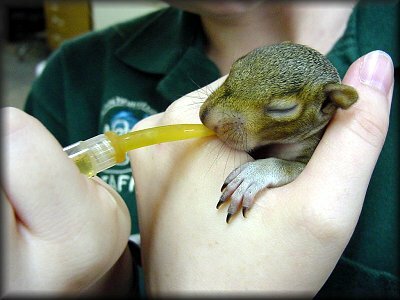 My daughter, Christy had worked at the WNC Nature Center as a volunteer and as an intern for 3 years. 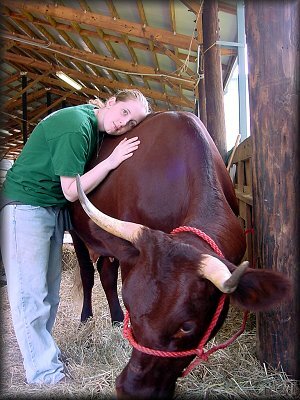 Here are a few pictures she has taken, as well as a couple of her with the Red Devon cows at the Dairy Show in 2003: Cougar, Bobcat, Black Bear, Baby Squirrel, Opossum, Burro, Red Devon Cow, and Red Devon Naptime. 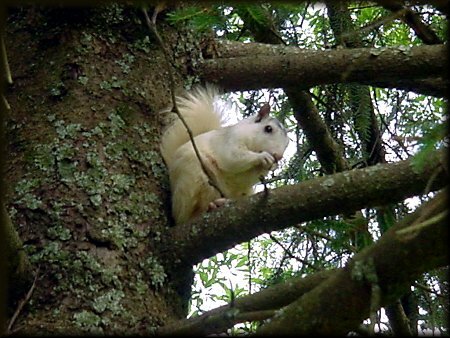 The annual White Squirrel Count is held in October every year in Brevard, North Carolina. 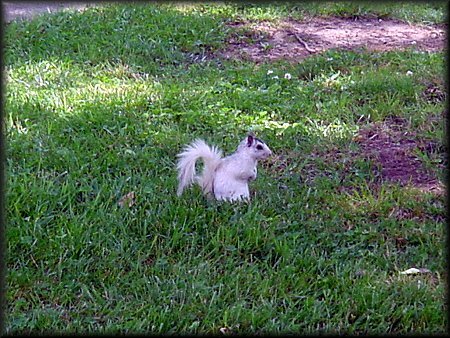 It is a long term study of the distribution and abundance of the white squirrels in Brevard. The survey is conducted by volunteers through Brevard College under the direction of biology professor Bob Glesener. The count has been going on for 10 years now. 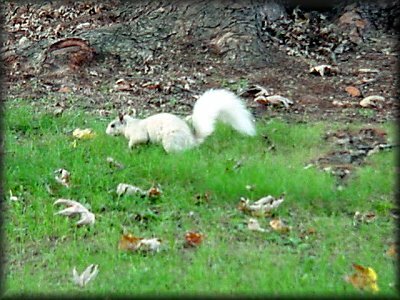 For more indepth results with populations compared to mast production, see the White Squirrel Research Institute Site. 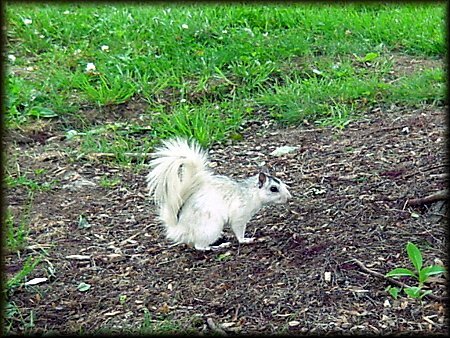 Here are a couple of pictures of Brevard's white squirrels that I took: squirrel1, squirrel2, squirrel3, squirrel4, squirrel5, squirrel6, squirrel7. I think they posed rather nicely for the camera. Hey, they know they are protected and well liked here. 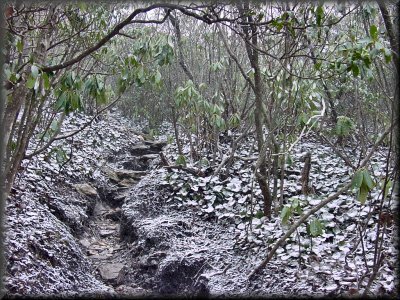 Begun in 1998, in one of the most ambitious projects to date in ecology is the "All Taxa-Biodiversity Inventory" being conducted in the Great Smoky Mountains National Park. It has been going on for over 10 years and may take as long as 15 years to complete. It's purpose? To catalog every plant and animal in the half-million acre park, and to show the relationships between plants, animals, effects of air pollution, pollinators, and the ranges of animals. With this understanding comes the ability to better protect what is in the park, especially with development along the fringes of the park. Why the Smokies? Though not quite as diverse as a rainforest, the topography, fairly mild climate, high rainfall, and mountains that were never glaciated during the last ice age makes for a very diverse location in a concentrated area. Since most of the plants and mammals are known in the 60 year old park, the concentration is focused on the smaller life forms. It is speculated that there is 100,000 species to be found in the park. In the first 3 years of the study, over 165 species previously unknown to science, and another 1,500 species never before seen in the Great Smoky Mountains National Park, had been found. And not everything found has been microscopic in size, as a 18-inch long earthworm was found, a new species of salamander, 40 new spiders (yikes! ), new crustaceans, flies, slime molds, segmented worms, algae, fungi, springtails, caddis flies, and others. In one 24-hour period, biologists found 706 species of moths and butterflies. Including the Ghost Moth, found in only 2 other places. Scientists are finding more and more that it's the little things that run the ecosystem, and though the larger species have been throughly studied, the relationship of the smaller species are not yet known. Read more about this at Discover Life, a nonprofit organization involved in coordinating the project with the Park Service, US Geological Survey, and many researchers at several universities. The "Great Backyard Bird Count" was held this year from February 15th to February 18th. It is a project sponsered by the Cornell Lab of Ornithology and the Audubon Society. All information gathered is reported by volunteer individuals, such as myself, and reported via the internet. The purpose? To see which species have increased and which have declined, which have kept to their current range, and which have migrated to new areas. It is a fun way to help with research that no one could afford to pay for, but the rewards of doing the count and helping with the research is beyond measure. You do not have to report from just your "backyard" but where ever you may be, just report by different zip codes. I reported my results from home, around Asheville, Owen Park (near the house), Biltmore, and Beaver Lake Bird Sanctuary. The biggest change around the house in the past couple of years are the White-throated Sparrows that we never used to have and are now a regular winter visitor. Naturally the birds on the Biltmore Estate near the river and in fields were different: almost too many to count - Canada Geese, Mallards, American Black Duck, Crows, Red-tailed Hawks, and Belted Kingfishers! Above is this very special Redhead Duck from Owen Park. Update through the 2008 season: For the state of Georgia, a record 1,646 nests were counted for loggerhead turtles along the states 100 mile coast line. 2008 was the 20th year that biologists and volunteers counted loggerhead nests along the coast of Georgia. This year's counts did exceed by 9% last years, though some nests were lost to Tropical Storm Fay in September of 2008. Female loggerheads lay eggs from May through August, and the eggs hatch into October. Researchers use nest counts as an indicator of overall health of the population, as loggerheads spend most of the year out at sea. For the state of South Carolina, 4,500 nests were counted as its best season since 1999. For the state of North Carolina, final numbers were not official, but at least 832 nests were counted. That was already above the state's average of 715 nests per year. All counts in all states reflect nests destroyed by Tropical Storms Fay and Hanna in August and September. So there were less hatchlings because of those destroyed nests. There were less dead loggerheads washed up onto Georgia beaches in 2008, which have been in part of fewer shrimp boats trawling in Georgia waters due to high fuel costs and low costs of market shrimp prices. 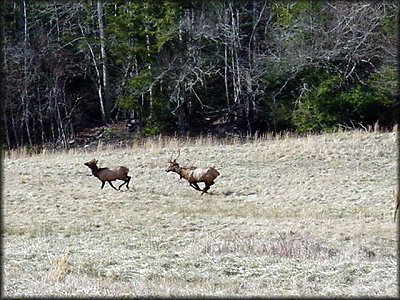 On Friday, February 2, 2001, 26 elk were re-introduced into Cataloochee Valley, located in the Great Smoky Mountains National Park. This was the first of 3 releases of elk that disappeared from the park 150 years ago. 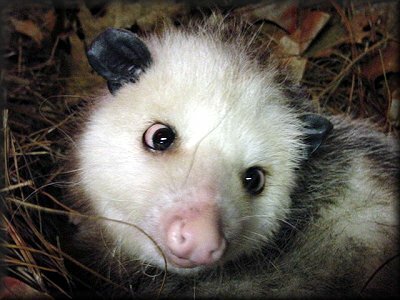 They disappeared because of extensive hunting and loss of habitat. 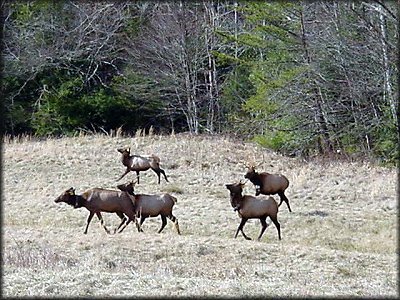 The small herd was first released into a holding pen in the Cataloochee area, and as of early April, they had been released totally into the wild. 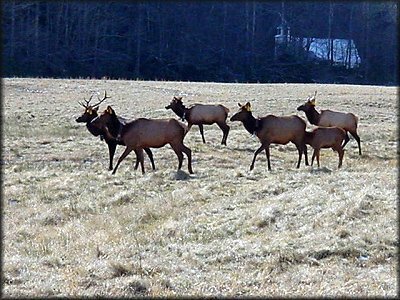 The upper section of the Cataloochee Valley where the elk have been released will be accessible to the public. 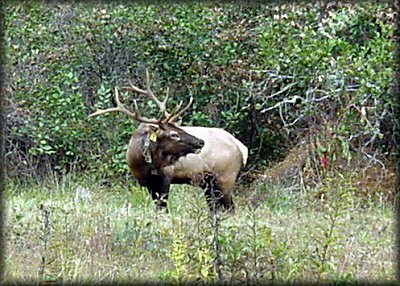 Visitors will have an excellent chance to see the elk, but some caution must be used since elk are wary but not skittish like deer. And will not back down if threatened, but common sense hopefully will rule and visitors will view them from a safe distance. 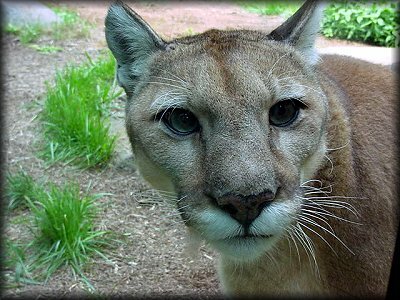 The other two releases will be in 2002 and in 2003 with a total of 76 animals being released. This a 5 year experimental release that should someday be considered a success. These high-tech elk have radio-collars, being tracked by the University of Tennessee and the U.S. Geological Survey to assess habitat use, food preferences, and mortality. 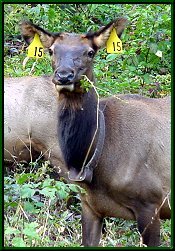 The elk also have GPSs (Global Positioning System), and are tracked by satellite. The program will only be halted if the elk threaten to overwhelm park resources or come into conflict with park visitors. Sometime on June 22, 2001, the first baby elk, a male, was born! He was located by Rangers and weighed 40 pounds. 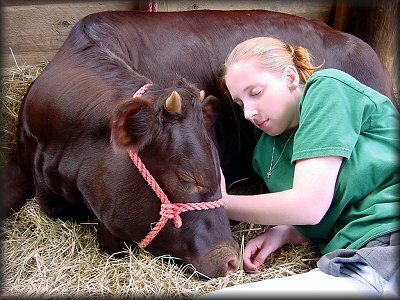 The calf is referred to as "Number 29" so as not to give anyone the impression that this is a domesticated animal, but was called "precious" never the less! He was born in a blackberry thicket close to the Cataloochee Valley meadows. The mother moved him to another area since they are vulnerable to predators in their first few days of life. The first confirmed death of an elk calf in the Great Smoky Mountains has occurred. It was a 1 month old female that was killed by a predator, most likely a coyote. And though I hated to hear it, the officials do not view this as a setback, since they needed to know if re-introducing elk into the park could become a natural cycle of life and death. It shows that predators will help control the elk population. Officials also suspect that predators killed 2 other elk calves, but can't confirm it. When the elk originally arrived, pregnancy tests confirmed 8 elk were pregnant, then 6 were born, but only 4 had been observed in the wild. 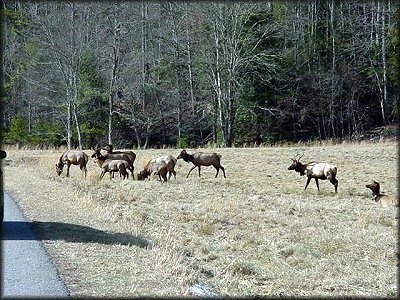 The elk have remained a popular attraction, since April when the animals were released, visits to Cataloochee have more than doubled each month. Hopefully the 3 remaining babies will survive and more will be born next year with the release of 25 more adult elk. 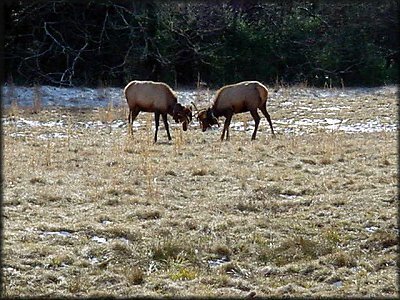 UPDATE 2/10/01: Phase 2 of the 3 year experiment has begun with the arrival of 27 more elk from Elk Island National Park in Canada. They were released into a holding pen where they will remain until spring. This area is off limits to the public, but they will be visible when released in the spring! 24 of the original 25 have survived, and of the 6 calves born, only 4 are confirmed to have survived. The baby survivors now weigh more than 200 pounds and are in excellent condition. 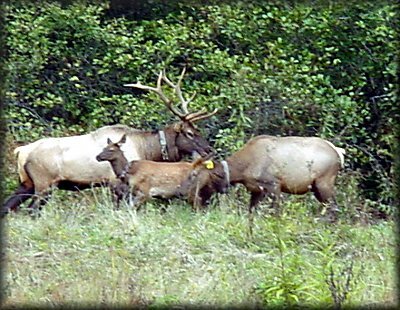 UPDATE 5/2/02: Though veterinarians have ruled out predators and poaching, 3 of the new elk have died. They had been released from their holding pen the week before. The park spokesman was reported as being disappointed, but not surprised, and the researchers have been pleasantly surprised that the mortality rate is as low as it is. The dead elk were apparantly malnourished, though the cause is not clear. Food was provided for them, but caretakers are not in a position to watch the elk eat and do not know if some didn't eat due to not adapting to the new environment. The dead elk were all females, two of which were pregnant. This is unfortunate. UPDATE 2003: The article above relates the history of the release program and a couple of updates, but I wanted more here. The picture at the top of the page was taken this week and seemed to capture the "Nature Haven Nature News". So Elk #15 will be the mascot here! After 2 1/2 years of the release program, there are 46 survivors of the 52 released animals. This summer 12 or 13 calves were born, and 8 have survived, which slightly better than the 50% mortality rate of the past 2 years. 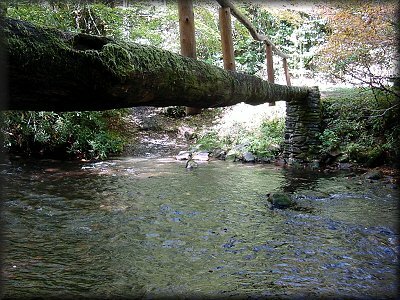 Though visits are up to this area of the park, it is still a very remote and wild place to visit. We hiked the Caldwell Fork and the Boogerman Trail and did not see even one person. (They were all looking for the elks at the meadows)! Viewing is best early morning or late afternoon, and the hiking is a great way to spend the middle of the day. We even had the pleasure of hearing a male elk "bugle". It is an eerie sound in this day and age, especially since there are no highways or anything else to interfere. 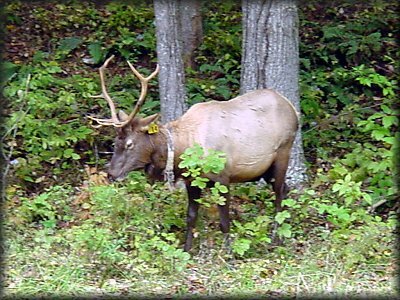 Here a a few pictures we took of the elk, the Cataloochie Valley, and the great hiking trails: Elks, Elk Group, Large Antler Elk, More Elks, Male Elk, Cataloochee Valley, Trailhead, Red Squirrel, Big Trees, Creek, and Genetian. 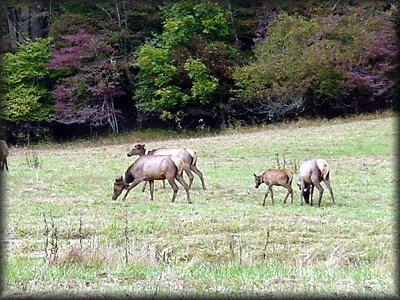 UPDATE 10/01/07: As the Elk Release in Cataloochee is in its final months in its final year, biologists are needing more time to evaluate the experiment. The Great Smoky Mountains National Park wants to extend the experiment by 2 years. They are still trying to determine if the herd can be viable. There are only 50 elk right now, and a single event could wipe them out. The herd is still small due to the 3rd release being cancelled because of ban on importing elk from Canada and a lack of other sources. With the survival rate of calves at about 50%, and with 75% of those having been male, the potential loss of a few females could make the population decline at this point. 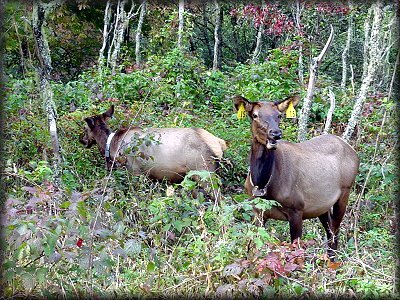 The elk have been a very popular addition to the park, and should have every chance to survive and grow. Two meetings are planned to get public comment about the proposal. 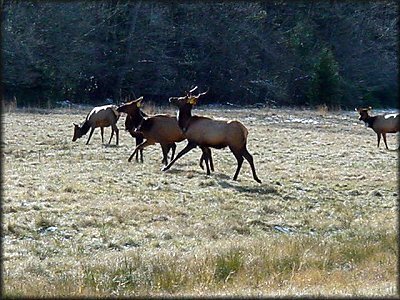 UPDATE 08/03/08: The NPS is again practicing predator management that began in 2006 to help with the newborn elk calf survival rate. 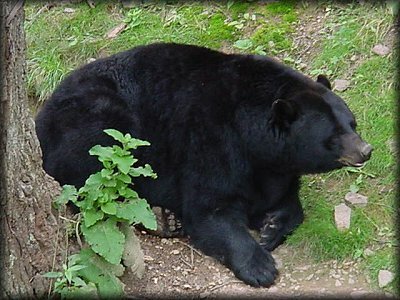 From the peak of the calving season, late May through early July, bears are being trapped and relocated (with radio collars) to western portions of the park. Even knowing that nuisance park bears relocated within the park will return to the area, the time gained from their absence will help with the calves becoming old enough to travel safely with their mothers. This helped with 2007 being an above average year for calf survival. No, there were no passenger pigeons found alive. 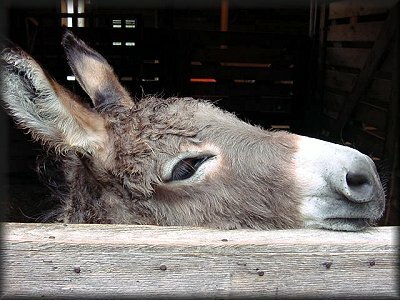 But one of the very few preserved ones was taken out of a vault that the Smokey Mountains National Park has. It was for artist Robert Tino to create a painting of the bird for limited edtion prints to be sold to benefit the Tremont Institute of the Smokey Mountains National Park. The astounding thing is that there were 3 to 5 billion passenger pigeons in North America in the mid 1800s, and 50 years later, they were all but gone! They accounted for up to 40 percent of all birds on the continent! Audubon remarked that in 1813 looking up into a Kentucky sky, "the light of noonday was abscured as by an eclipse... and with a noise like thunder they rushed into a compact mass." In one of the few times in history, we have been able to say exactly when a species became extinct. The last passenger pigeon, named Martha, died at the age of 29 years at 1 p.m. on Sept. 1, 1914 at the Cincinnati Zoo. Huh? There really is one native jellyfish species in the Appalachian mountains. Really! The Craspedacusta sowerbyi, the Freshwater Jellyfish is found in this area as well as in warmer areas of North America. It is very small, less than a quarter of an inch, and stays at the bottom of ponds, so that they aren't usually seen by people. But, they are carnivores and capture their prey by stinging tentacles hanging from their umbrella shaped bodies. 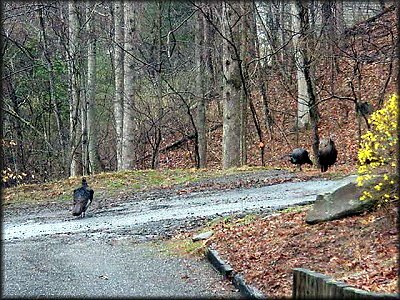 A very good article about them is found at the WNC Nature Center website, about some that were spotted at a Black Mountain camp (which is about 10 miles from where I am living). I had no idea that anything like this was in this area and I am amazed! 2008 was the year of the return of the 17 year periodical cicada in western North Carolina. And they were everywhere around here. There were so many you didn't even have to look very hard to see one and you sure could hear them. For several weeks, there was a very loud constant droning sound that is very unlike the sound made by the dogday cicada. They also look different. Periodical Cicadas are the largest North American member of order Homoptera. Periodical Cicadas emerge every 13 or 17 years in certain areas known as "broods". The ones here are 17 year ones that came out this year, and the last emergence was in 1991. Broods can overlap so that some may be seen in different years, but when there is a large brood in your area, there is no dought about them. There are only 14 broods of the 17 year cicadas and 5 of the 13 year cicadas in the country. Wingless immature cicada nymphs live underground feeding on plant roots. When they mature they burrow to the surface and climb up plant stems or any other vertical area and attach themselves with their claws. The skin of the nymph splits down the back and the adult winged cicada emerges. They mate and the females lay eggs. She uses a ovipositor in her abdomen to cut slits in the twigs of mature hardwood trees to lay the eggs. This doesn't do long lasting harm to the tree, but the twigs and leaves will turn brown and drop to the ground. This is very much in evidence around here as lots of oak trees have dropped their twig and leaf ends to the ground. The cicada nymphs will hatch and burrow in the ground for 17 or 13 more years. The following video is of the sound made by the 17 year Periodical Cicadas around my house. The video does not show them flying, but clearly there are a lot of them in the area to make this much noise. The park rangers of the Blue Ridge Parkway confiscate between 25,000 and 50,000 illegally harvested galax stems annually. But this is only 5 to 10 percent of the poachers. 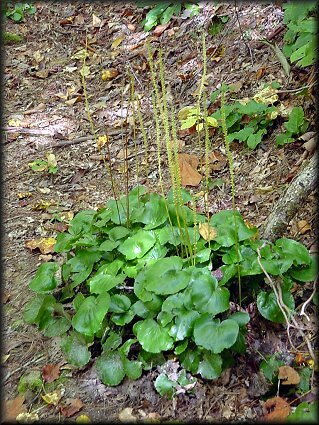 Galax, an ormnamental plant much valued by flowers shops, is found in the area, but can only be gathered with a permit and never along the Parkway. It has gotten bad enough that "tagging" of the plants is being done. An almost-invisible powder is put on the plant that can be detected and will tell where the plants were gathered from. There is also poaching of ginseng roots, log moss, and others. 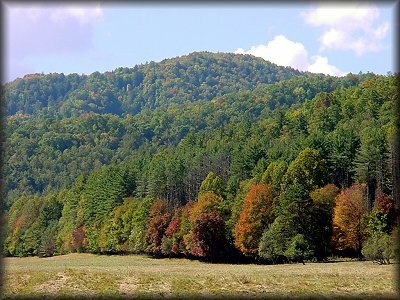 Half of the 175 forest products being sold for health and botanical uses are found in the Southern Appalachian region. These very popular plants are a very valuable resource, but more importantly they could be harvested to extinction if not controlled. The Forest Service is conducting a study to help find ways to curb poaching and develop a plan to protect the native plants and to allow harvesting. Hopefully between this and future labeling practices that will allow consumers to know that the plants were collected under appropriate circumstances, will help. 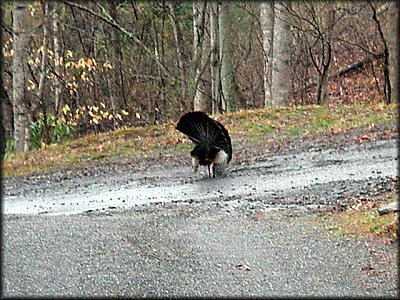 Meleagris gallopavo, the wild turkey is not just a big bird, but a species that has rebounded from near extinction at the end of the 19th century. wary bird that is a swift runner, has made a comeback to the point that it is spotted in areas it was not seen in a few decades ago. This is the case here. 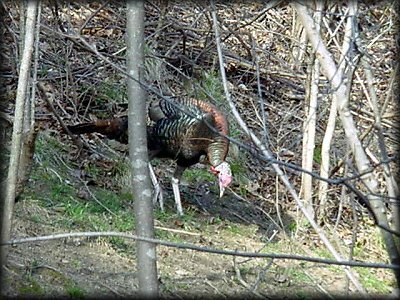 I spent alot of time trying to spot the wild turkeys that my neighbors had the pleasure to see. 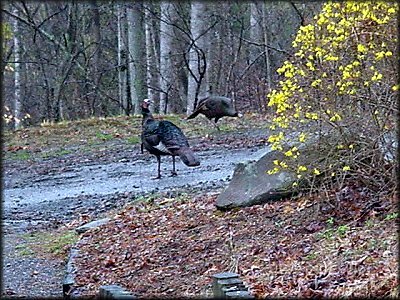 I small glimpse was all I was rewarded last summer, so I was quite pleased to see one male (fluffing his feathers for the females) and 4 females pecking around the house on Thursday, March 21. Actually the cat spotted them, and my husband got up to look out the window at what she was watching so attentively. She was dreaming big about catching one, but I know that bird would catch her most likely. 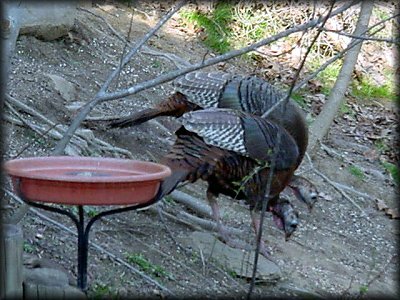 Luckily we caught a few on camera: Two Turkeys, Fluffy Turkey, Two Females, Turkey from the rear, and last, but not least, Male with Females. They're back! 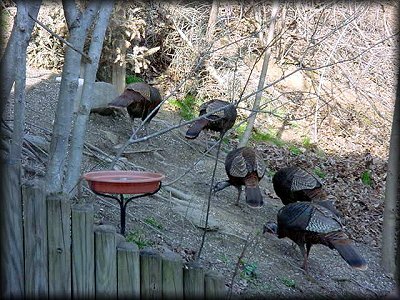 And eatting birdseed below the feeder...Bright Colors, Group of Feeding Turkeys, and Two Turkeys. 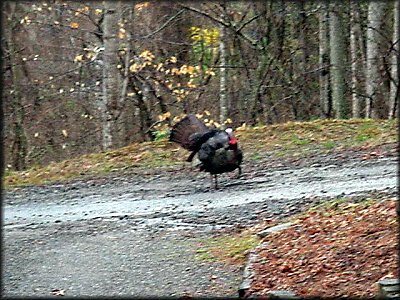 UPDATE: I have seen a lot of turkeys this year. It is just wonderful. The largest flock that I have seen had about 20 members. Wild dogwoods in the Appalachian forests have slowly been dying from a fungal disease, dogwood anthracnose. I have noticed that every year there are less and less wild dogwoods that are healthy enough to bloom. This has been happening since the 1970s in this area. This disease is something that can be treated with fungicide sprays for trees in small areas, but it is not feasible to do that in National forests, parks, and any wooded land. But, researchers have found thriving stands of dogwoods in the Great Smoky Mountains National Park in areas that had once burned. The number of dogwood trees had doubled in three research plots that were burned in a 1976 wildfire. This is significant in the park where mortality had reached 60 to 94 percent of wild dogwoods. Researchers are considering if prescribed burns may be able to maintain conditions that will allow dogwoods to persist. They believe that burning clears away the canopy and underbrush that allows the moist, dense conditions for the fungus to thrive. A more opened forest will allow plenty of sunlight and fresh breezes for dogwood seedlings. Dogwoods were found to do best in areas that had experienced one fire every 15 years, compared to areas that burned more often or not at all. Dogwoods are a showy beautiful tree whose blooms speak of spring, and they play a valuable role in the forest ecology. They provide berries for more than 50 species of birds and small animals. They also add calcium to the forest floor from their fallen leaves. In Gaston County North Carolina, near Charlotte, wild bigleaf magnolias are capturing the attention of biologists. First because the tree stands up to 60 feet tall with 32-inch long leaves, and secondly because 95 percent of the big leaf species in North Carolina are found in this county and experts do not, at this time, know why. This tree has the largest flowers as well as the largest leaves of any native species other than tropical palms. These flowers will bloom for only about a week. In May of 2002, an international symposium was hosted in Gaston County with the Bigleaf Magnolia as its signature plant. This tree has quite an interesting history in this country as well. 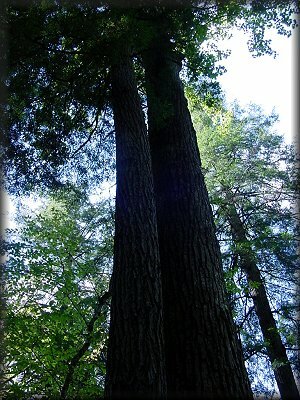 It was named by the French naturalist and explorer Andr� Michaux who discovered this tree in 1789. He called it the "queenliest of all the deciduous magnolias". The symposium coincided with the 200th anniversary of Michaux's death in Madagascar, off the coast of Africa. Michaux came to America as an employee of French King Louis XVI to find plant seedlings to restock French forests depleted by years of harvesting of lumber to build warships. 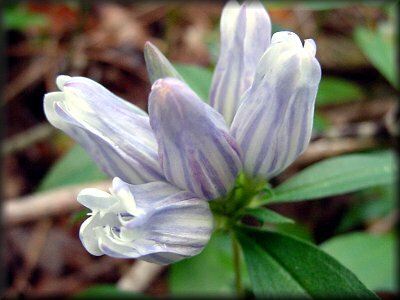 Michaux was also a friend of Thomas Jefferson and author of the first book on plants of the Eastern United States. After he discovered the plants in what is now Gaston County North Carolina, he returned from his base in Charleston South Carolina six times to study the plants and eventually shipped some to England and France. Once thought to winter in Mexico, the Rufus hummingbird has been occurring more frequently in this area, Asheville, NC, for the past several winters. At least later than any Ruby-throated hummingbird has stayed in this area. There have been some banded, photographed, and measured by hummingbird experts Bob and Martha Sargent from Alabama. They even removed one tail feather to determine a bird's DNA. She was not harmed and was released. These birds were once considered lost if found in the fall or winter in the southern USA, but now are occurring enough that it is thought that their migration has changed. Banding has shown that the birds are returning to the same feeders during the winter for several years in a row. DNA testing has helped to determine that birds found in the Southeast in the winter probably spent the summer in Washington state and British Columbia. It is believed that birds have been migrating through here for as long as 10 to 20 years, but only since people have been leaving feeders out longer have they been spotted. The Rufus is the most cold-hearty of the 15 species known to breed in the US and Canada. Studies have indicated that hummingbirds do not rely on floral nectar as much as once thought. It is probably insects that compose most of their diet. This would account for them surviving without feeders as in the past. 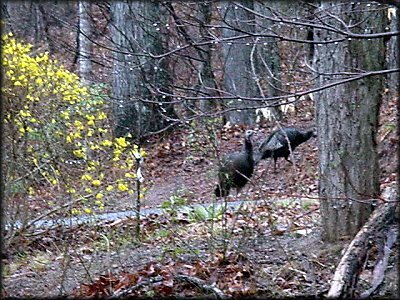 They do usually move on from this area in January or February, probably to warmer areas.